$9.95 fast tracked shipping Australia & NZ wide! 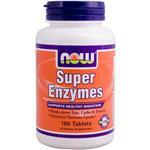 NOW Super Enzyme tablets are a comprehensive blend of enzymes that support healthy digestive functions. Bromelain, Ox Bile, Pancreatin and Papain have been formulated to optimize the breakdown of fats, carbohydrates and protein for maximum assimilation. As a dietary supplement, take 1 tablet with each meal. Consider taking this product in combination with NOW G.I. Support, Optimal digestive System and DGL. Calcium Carbonate, Stearic acid (vegetable source), Croscarmellose Sodium, Magnesium Stearate (vegetable source) and Tablet Coating. Do not eat freshness packets. Keep in bottle. © 2019 VitaminShop.Melbourne. All rights reserved.